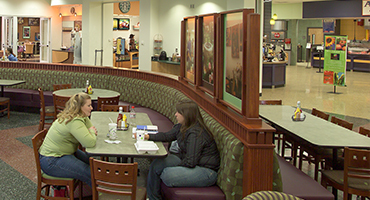 The Summerville Food Court in the Jaguar Student Activities Center offers Freshens smoothies, Starbucks coffee, Slice of Life pizza, sub sandwiches, Hissho Sushi, WoW Cafe, as well as a variety of grab-and-go food items. Located in the first floor atrium of Allgood Hall on the Summerville Campus, The Allgood Cafe offers a variety of sandwiches, wraps, salads, microwaveable meals, yogurt parfaits, fruit cups, and vegetable cups. 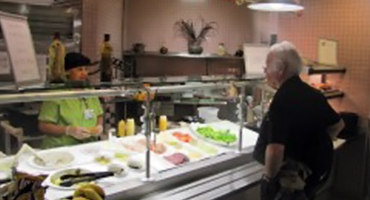 Located at 1120 15th Street on the 2nd floor of the hospital, Terrace Cafe offers a self-service salad and fruit bar, fresh readymade salads, fruits, desserts and full breakfast, lunch and dinner service with a choice of three entrees per meal. Hot sandwiches, char broiled burgers, fries, a deli and a specialty bar featuring baked potatoes and ethnic foods are also available. 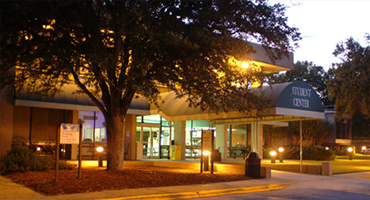 Atrium Dining Hall, located in the Student Center on Laney Walker Blvd. offers a full service breakfast, lunch & dinner meal program open to all students, faculty, and university and health system staff. Starbucks coffee is available in the Student Center and the Harrison Education Commons Building. Our affordable meal plans are designed to meet the dining needs of students.